Daisies joined at the hip. 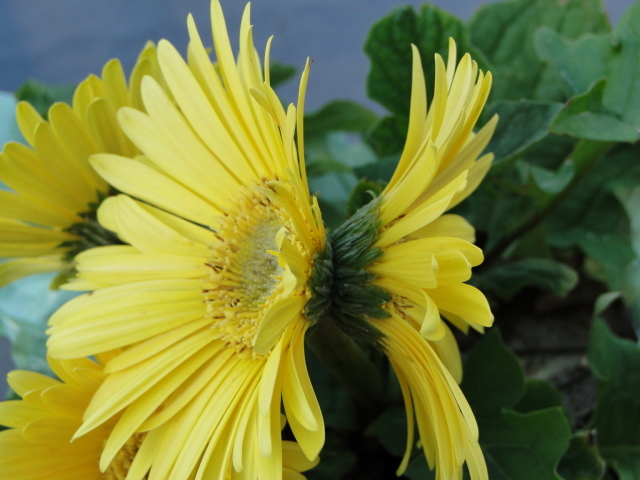 There still isn’t a lot of information about why this occurs, but it seems that Gerbera daisies are among the species more likely to sport conjoined flowers. A discussion of a two-headed echinacea over at the Garden web indicates that doubles like this can be caused by aster yellows, a disease that causes flowers and leaves to appear twisted. It also can be a natural mutation. Among vegetables, two-headed fruits happen more commonly. For fun photos of unusual plants and fruits, check out the Garden Mutants web site. Bizarre! I’ve never seen anything like it! I’ve never seen anything like that before. Neat! Now, I saw two monarch butterflies that looked like this today. I’d just released a male after it came out of its chrysalis, and a local male nectaring outside immediately attacked it, and they sat on a 7′ eupatorium in frozen struggle. Try a pc search for that on google. Thanks for figuring this out for me. I knew you would have the answer! Wierd, huh?! But kind of cool and quite a topic of conversation with my neighbors. Thanks for sharing the photo, Elly! I’ve had mutant veggies before, but never seen this on a flower. Greetings! The term you are looking for is “Fasciation” and is otherwise known as “cresting.” The process of fasciation occurs when a bud or stem has had some kind of physical damage. The damage can be caused by bacteria, insects, frost, or rogue clippers. Some plants are more susceptible to it than others. I have one also very cool. It’s a Gerbera Daisy. I looked on this page because I have just found a ‘two-headed’ common daisy! I think it’s neat as can be. I have a potted Gerber daisy that produces twins every year. This year it is red last year they were orange. If I could figure how to send you pic I would share them. I was sorting out all my clearance annuals from Lowe’s today on the patio and came across on of my daisies with a 2-headed flowering stalk. Pretty cool, twins. The same thing happened to my plan and I had to research to see if this was common. Thank you so much for posting.